respect the needs and wishes of others. It’s February 18, 2012. The top song is Kelly Clarkson’s “Stronger,” which is about as generic a post-breakup “I don’t miss you” song as it’s possible to get, and rooted in one of those sentiments that seems nice on the surface but quickly becomes utterly reprehensible once you did into it, namely that “what doesn’t kill you makes you stronger.” The top movie is Safe House, which once again I have not seen, but just to prove that I’m not completely incapable of watching movies, I can say with certainty that this is the weekend I saw Studio Ghibli’s Arietty, which was not up to their usual standards but still well worth watching. In the news this week, the international community condemns the mounting violence in Syria, with the U.N., China, and the U.S. Senate weighing in; Whitney Houston’s funeral is held; and Greece agrees to cut government spending during a recession as a condition of being bailed out of its financial crisis by the rest of the European community. Because that’s not completely the opposite of how you deal with a recession. On TV, fortunately, we have “A Friend in Deed,” a highly entertaining but troublingly problematic episode by (of course) Amy Keating Rogers and directed by Jayson Thiessen. Primarily this episode serves as a continuation of the theme of love from the last episode; “Hearts and Hooves Day” was about trying to create a new love, while “A Friend in Deed” is about lost love. There have been few images in this series as heartbreaking as the sequence in which Cranky wanders Equestria seeking Matilda, growing older and sadder as the montage continues until he is finally the angry, broken old donkey he spends most of this episode as. It is Pinkie Pie who finally brings him and Matilda together again at last, of course; that’s what Pinkie Pie does. She is the social glue that holds most of Ponyville together, as the episode’s first of several musical numbers depicts. But as always “Party of One” casts a pall over everything Pinkie Pie does; though she is upbeat and cheery about her desire to “make all her friends smile,” the truth is that she desperately craves constant approval. This is part of what makes Cranky a strong foil for Pinkie Pie. Recall my discussion of the two selves in regard to that episode: the experiential self desires pleasurable experiences in the present, while the remembering self wants to create good memories. In most people the two selves are more or less balanced, but in tension, but in our focus characters for “A Friend in Deed” they are wildly out of balance. Where Pinkie Pie sees the present as preferable to the misery of her upbringing on the rock farm and suppresses her remembering self, Cranky is fixated entirely on a happy memory, his one night with Matilda, and suppresses his experiential self. His cynicism and curmudgeonly attitude are defenses against a world that, as far as he is concerned, contains nothing of value. All he cares about are the physical reminders of his memories, which he literally drags behind himself everywhere he goes. Though Pinkie extends him a hand of friendship, he is no longer interested in such things; relationships in the present brings him no joy because all he cares about is reliving his memories. None of which justifies Pinkie’s behavior in this episode. She is relentlessly thoughtless and self-centered from beginning to end, and as usual Rogers depicts this behavior comedically. As usual, Pinkie does not learn the lesson she (and increasingly Friendship Is Magic) desperately needs, that it’s okay to not be friends with everyone, instead learns the secondary lesson that people have varying friendship styles, and sometimes the nicest thing you can do for a person is give them some space. Which is a good lesson, and one Pinkie needs, but still ignores that she spends the entire episode running roughshod over Cranky’s repeatedly expressed wishes. Instead, given Cranky’s transformation from unhappy and friendless at the beginning, to happy and friends with Pinkie at the end, it seems we have here the precise opposite of the lessons of “Green Isn’t Your Color” and “Lesson Zero.” Ignore the wishes and needs of others, this episode says, and force your “help” on them whether they want it or not. Since you know better than they what they need, it will all work out in the end. For all that it is undeniably fun, this episode is based on a deeply toxic premise. I’ve cited Odd Girl Out before, and it is time to do so again: central to that book’s thesis is that telling children that friendship and “niceness” are mandatory renders them unable to express aggression openly, forcing them into deeply harmful alternative aggressions that can leave scars that last decades. Pinkie’s need to be friends with everyone leads her to some extremely unpleasant behavior in this episode, such as when she ignores Cranky and roots through his property. Ultimately, it leads her to destroy his most cherished possession, and it is only pure luck that allows her to make it up. Cranky has a right to set boundaries. If he doesn’t want Pinkie around, he has every right to push her away. But ignoring those boundaries allows Pinkie to reunite him with Matilda, implying that he was in the wrong by setting boundaries and trying to push away a person that made him uncomfortable. The implications are horrible, considering how hard our society works to tell women and girls in particular that they are not allowed to set their own boundaries, that they must either conform to a self-contradictory and impossible standard or accept whatever happens to them. Again, this episode is not at all poorly constructed. It is very clear that a great deal of thought has one into making it funny, visually appealing, and musically engaging. “Smile” has deservedly become one of the most popular songs from the show, and the visuals which accompany it are fun, funny, varied, and attractive. So it is all the more worrisome that apparently no thought was put into what this episode says about what is supposedly the core focus of the show, the basics of relating to one another. Pinkie is, frankly, completely out of control, both within the universe of the show and in terms of her ability to distort the narrative. She is apparently incapable of learning, incapable of listening, and determined to trample over others, but she is much too entertaining for the show to jettison or even minimize her role. The question is, what could possibly force Pinkie Pie to change, to begin growing as a character in a way that could resolve this conundrum? She appears immune to consequences–but in a few episodes we’ll see that isn’t entirely the case. Next week: Another character, another foil. Maybe there’s good reason she’s afraid of her own Shadow? I love the song “Smile Smile Smile” so much I would set it as my ringtone if I ever put my phone on any setting other than Vibrate (and I might do it anyway), but I can barely watch the rest of the episode, because it's just so cringe-inducing. 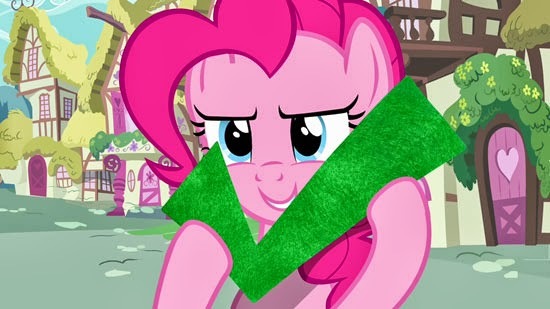 Pinkie's antics remind me of every social faux pas I've ever made or almost made or worried about making (as if I don't already remember those vividly and repeatedly enough) and then some, all packed into one half-hour and cranked up to eleven. “Smile Smile Smile” is my ringtone. It's a good song! So, are you deliberately making terrible arguments just to make social justice look bad, or…?